DUTCH insurer ING has emerged as the front-runner to buy the Menara Standard Chartered on Jalan Sultan Ismail for almost RM300 million, sources said. A decision and an announcement on the winner may be made as soon as next week, a source told Business Times. It is believed that the Government of Singapore Investment Corp Real Estate (GIC RE) is selling the office building to ING Real Estate Investment Management. While it could not be determined how much ING would be paying for the property, industry executives estimate it would be around RM900 per sq ft.
"Based on the recent Menara Citibank transaction of RM970 per sq ft, Menara Standard Chartered should go for about RM900 psf," one source said. It was also reported that the owners were looking for a yield or return on investment of about six per cent. Based on a nett lettable area of 321,000 sq ft, the building could be sold for around RM285 million. ING said it could not comment on the matter immediately. "The purchase of properties is an ongoing investment initiative that ING Malaysia conducts in the markets we operate in of which to date we have an estimated investment assets under management of RM10 billion," said Karen Yoong of ING Insurance Bhd's Branding & Corporate Communications division. GIC RE did not respond to Business Times' query while calls to Rahim & Co's representative handling the deal went unanswered. According to GIC RE's website, it bought Menara Shahzan Insas through its affiliate Reco City Sdn Bhd in November 2001 for RM135 million. Built in the mid-1980s, Menara Shahzan Insas is a 42-storey office tower with a total gross floor area of 46,700 sq m.
The building was later renamed Menara Standard Chartered in July 2004 after Standard Chartered Bank relocated its corporate headquarters there. The website also said the building required extensive renovation due to its age and condition at the time of acquisition. 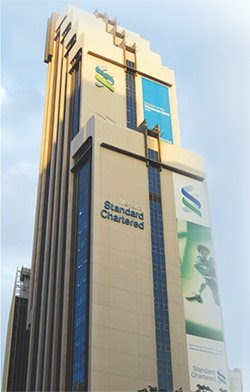 Once renovation was completed, GIC RE repositioned Menara Standard Chartered as a premium office building, attracting class "A" office rentals and international tenants. GIC RE is one of three business units under GIC, one of two of Singapore's investment arms. Temasek is the other arm that is more well-known among investors. Together, they manage Singapore's foreign reserves. GIC RE's website states that its current assets in Malaysia include holdings in the Sunway Pyramid Mall, Sunway Hotels and Resorts and a stake in the City Square shopping mall in Johor Baru. SINGAPORE: YTL Corp, Malaysia's biggest builder, may open shopping malls in Singapore and London under its Starhill brand in the next 12 months, managing director Francis Yeoh said. "London is actually pursuing us to do a Starhill," Yeoh told reporters in Singapore yesterday, referring to the company's luxury Starhill mall in Kuala Lumpur. A recent decline in commercial rental rates has made the plan more viable, he said. YTL's fourth-quarter profit dropped 36 per cent as income from its property and power businesses slowed, the company said on August 19. Demand for real estate has eased as Malaysia's economy grew in the second quarter at the slowest pace in a year. YTL in April paid a record price of RM85 million for property of less than an acre in Kuala Lumpur, the Edge newspaper reported at the time, without saying where it obtained the information. YTL also in November bought an apartment building in Singapore for a then-record S$435 million (RM1.05 billion), increasing its investment in a city where home prices had climbed to a 10-year high. Gains in residential property prices have since eased in Singapore, rising 0.4 per cent last quarter, the slowest in four years. SINGAPORE: After having successfully launched the Starhill brand in Dubai, YTL Corp Bhd wants to expand the concept to Singapore and London. “We are being pursued by people from London. We also want to do a Starhill in Singapore and it can either be a greenfield or an existing property,” managing director Tan Sri Francis Yeoh said during the “The Luster of Luxury” forum at the Forbes Global CEO conference yesterday. “Time is now a window for us and I can wait for 12 months to make a capital investment in Singapore,” he said. YTL owns the Starhill brand concept. It first developed the concept in Kuala Lumpur and last April it launched the Starhill Gallery in Dubai. Yeoh believes there is a booming market for luxury products and that “luxury should come to a person instead of the person going to luxury.” Malaysia will also be home to the “Forbes Asia Luxury Forum: The Art of Time” for the first time in Kuala Lumpur on Dec 5. It will examine the booming market for luxury timepieces in the region. A half day conference will also be held. The event is held in conjunction with YTL’s “A Journey Through Time II” which kicks off from Dec 4 to 14 at the Starhill Gallery. It will be Asia’s largest watch and jewellery showcase. “YTL is an ideal partner for Forbes Asia in co-hosting this event given its expanding portfolio of luxury lifestyle resorts, luxury retail outlets such as the Starhill Gallery and other luxury-related projects,” Forbes vice chairman Christopher Forbes said. MALAYSIANS expect the country to experience its next property boom in two to five years, according to a survey conducted by property website, thinkproperty.my. In a statement yesterday, thinkproperty.my said the survey, which received responses from almost 950 participants, showed a surprise strengthening of the people's perception of the Malaysian property market compared to last month, although overall confidence was still low. “According to a survey, 43 per cent of the participants believe that the next property boom will be in 2-5 years, 20 per cent said within two years, 25 per cent thought it will happen in 5-10 years and 12 per cent more than 10 years,” it said. Thinkproperty.my chief executive officer Asim Qureshi said the data from the survey were positive for Malaysia's property market. “People perceive that the medium term for property in Malaysia is strong,” he said. CYBERJAYA landowner Cyberview Sdn Bhd says that the average occupancy rate for offices in the MSC status area is at 94 per cent. The demand for office space is so great that Cyberview will start work on SME Technopreneur Centre III a year ahead of schedule. Cyberview had planned to start work on the third instalment of offices catered to small and medium enterprises in 2010. Cyberview was set up by the government in 1996, with the Minister of Finance Inc owning 70 per cent and the remaining stakes held by different government agencies, which include the Multimedia Development Corporation (MDeC). Between September 2007 and August 2008, the supply of office space in Cyberjaya had increased by another 1.05 million sq ft to 4.22 million sq ft.
Another additional 1.64 million sq ft of office space will be ready by the third quarter of 2009, bringing the total space for businesses in Cyberjaya to 5.86 million sq ft.
Cyberview managing director Redza Rafiq said interest in the intelligent city has also not waned, adding that MDeC is in talks with between five and six multinational corporations (MNCs) to set up base in the area. He did not elaborate. MORE PROJECTS: MDeC is in talks with five to six multinational corporations to set up base in Cyberjaya, says Redza. There are 474 companies located in Cyberjaya, 30 of which are MNCs. Meanwhile, the master developer of Cyberjaya, Setia Haruman Sdn Bhd, is also upbeat about its housing projects in Cyberjaya. Demand is now shifting to out-of-town buyers from just those working and living in Cyberjaya, said Setia Haruman chief operating officer Lao Chok Keang. The Emkay group owns 75 per cent of Setia Haruman, which was appointed as master developer of Cyberjaya in 1998. Setia Haruman has developed some 3,000 houses, of which 250 are high-end developments while the rest are medium-cost housing. To date, some 750 medium-cost houses and about 200 high-end units have been sold. More medium-cost houses are expected to be built in the area to meet demand for homes within the RM200,000 to RM500,000 bracket. SINGAPORE: China will remain a major real estate powerhouse even after the Beijing Olympics and despite the backdrop of weaker property prices, according to Hang Lung Properties Ltd.
Chairman Ronnie Chan said the market had been growing very fast in recent years before the slowdown about eight months before the Olympics. Hence, he said, a long-term players would have to devise ways to overcome the bear market. “Property is a long gestation industry,’’ Chan said during a session on “Rolling the Dice on Real Estate,’’ at the Forbes Global CEO forum yesterday. He said the biggest opportunity in China would include the large commercial and retail investments which could still bring in double-digit returns. On the impact of the US credit crunch, he said there had yet to be a fallout on China and Hong Kong. “Sooner or later, it (the impact) will reach here but, as long-term players, we are not perturbed. “China is an opportunity of a lifetime and we are buying land for future projects.’’Hang Lung allocated US$5bil for projects in China and it had already nine projects under way, he said. Apart from China, Vietnam also provided opportunities, although at a smaller scale, and that property prices had fallen 30% to 40% from their peak in 2007. “It is like getting into China 10 years ago,’’ said VinaCapital group chief executive officer Don Lam. “For those who missed the first round, it could be time to enter (the Vietnamese market). “True, there is a liquidity crunch, but for those who plan it right, it may take two to three years,’’ Lam said. He added that inflation had no follow-through impact in Vietnam where 75% of the population is agriculture based. VinaCapital is planning its second real estate investment trust of US$500mil, a follow-up from the successful US$800mil earlier. LONDON: British house prices kept falling sharply in the three months to August even as the average number of home sales per surveyor hit a new low, a survey showed yesterday. The Royal Institution of Chartered Surveyors (RICS) said its house price survey balance improved slightly to 81 in August from 83 but still showing a weak picture for the housing market, which is now slumping after a decade-long boom. ”A lack of mortgage liquidity is the key issue which is keeping the housing market from showing any real sign of recovery,” said RICS spokesman Jeremy Leaf. Faced with a global credit crunch, mortgage lenders have tightened up the terms on which they make new loans, demanding as much as 25% of a property’s value as a deposit when before they would look for 5% or even provide as much as 120% of the value themselves. The result has been a sharp fall in house prices and transactions drying up the effects of which are being felt right across the economy with construction and furniture retail companies particularly hard hit. RICS said completed sales per surveyor stood at just 12.7, the lowest figure since the question was first included in the survey in 1978. Inventory levels on surveyors’ books also fell back. As a result, the ratio of sales to the stock of unsold property an indicator of market slack fell to 15.4 from 16.9 in July. The tentative improvement in sentiment seen in July’s survey have also proven to be short-lived, with a bigger balance of surveyors expecting sales to fall further.